This airticle is aboot the Pennsylvanie ceety. For ither uisses, see Scranton (disambiguation). Frae tap, left tae richt: Scranton Electric Building, St. Peter's Cathedral, Downtown Scranton, Scranton City Hall, an Courthouse Square. Scranton is the saxt-lairgest ceety in the Commonwealth of Pennsylvania ahint Philadelphia, Pittsburgh, Allentown, Erie an Reading. It is the coonty seat o Lackawanna Coonty in Northeastren Pennsylvanie's Wyoming Valley an hosts a federal court biggin. 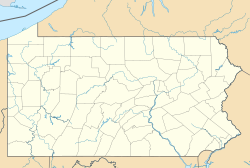 Wi a population o 77,118, it is the lairgest ceety in the Scranton–Wilkes-Barre–Hazleton, PA Metropolitan Statistical Area, which haes a population o aboot 570,000. ↑ "Population Estimates". United States Census Bureau. Retrieved 2014-06-11. ↑ "Scranton, Wilkes, Barre Metro Area". Usa.com. Retrieved 2015-10-26. Wikimedia Commons haes media relatit tae Scranton, Pennsylvanie. This page wis last eeditit on 11 Mairch 2018, at 18:48.